When I heard about Adele cancelling the last two performances of her tour, I felt profound sadness for her. I know how hard she has worked to endure injury, recover, and take the stage again. She now finds herself in an undesirable position – in the middle of another conversation about vocal injury. While I had hoped for otherwise, the usual spectrum of responses from the voice community rang out: a seeming even split between empathy and judgment. This reaction produces a serious problem in the singing community. Every day, I see at least one singer who has delayed coming in because they were afraid of being diagnosed with an injury. Their fear is rooted in many things. The first is that their voices are their entire identity, their music is their life. Singing is not simply something they do. It is who they are. Their entire sense of self is threatened when they find out they are injured. The second layer is the fear of judgment and it is this judgment that is crippling. They do not want a diagnosis because they will be next in the crosshairs of the singing world. In the voice community, sentencing comes fast and furious. “This wouldn’t have happened if…” If she practiced more. If she studied with me. If she didn’t write such difficult music. If she used backing tracks… it’s endless. I’ve struggled to understand this phenomenon because I know that if the singers didn’t do this to each other, the outside world wouldn’t dare to. When singers criticize each other, they open the door for the world to see an injured singer as weak, instead of hurt. This does not happen in any other endeavor where the body is used at a professional level. When Tom Brady tore his ACL and MCL (ligaments in his knee), other football players, coaches, trainers, and doctors did not lay into him about bad technique, pushing himself too hard, nor did they call that injury inevitable. The community bands together around the athlete, admits these are the perils of pushing parts of your body to an extreme, and rallies around him encouraging him on the path to recovery. It’s worth noting that significant periods of rest are built into a football player’s schedule, acknowledging the body needs a break when it is pushed athletically. The same statement applies to singers: the body needs a break when it is pushed athletically. But somehow singers are in a world where this is denied. They push a more delicate part, their vocal folds, even harder. This is the same body part that can be devastated by something as simple as a cold. But when a singer needs to cancel, take a break, or go on voice rest, they are met with questions about their technique, stamina, lifestyle and ability. The touring singer often does 3-4 nights in a row, with barely a day off in between. That day is usually spent traveling, not in restorative sleep. The musical theater singer belts 8 shows a week. And yet there is no forgiveness to be found from their peers. 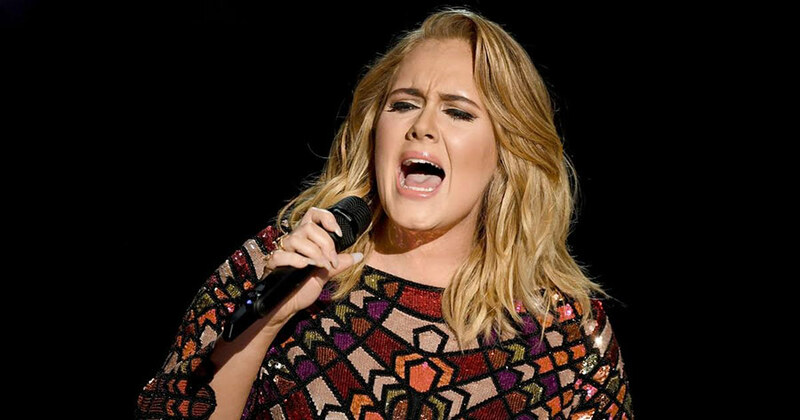 No one rallies behind Adele, admitting they too had an injury. They too needed to cancel. They too feel the demands are too high. They are afraid to stand up for each other because they do not want to bear what Adele has had to. Meanwhile, if all singers did stand up in a meaningful way, it is impossible that the judgment would continue. When I counsel a patient with a new injury, I spend less time talking to them about their actual injury. Increasingly, I focus on taking the burden of blame off their shoulders. I can see their self-doubt and devastation when there is a bump on their vocal folds. It is hard for me to undo years of misinformation but I try because the weight of that self-recrimination and doubt is suffocating. But worse still is that when they leave my office, they must swallow this. They can’t talk to their peers because they are afraid of how they will be viewed. They’re broken. I truly believe it is not as malicious as it seems. Singers hear about injury and it preys on a vulnerable and scared place. What if that happens to me? The rationalization defense mechanism is launched and the singer comes up with reasons why this happened to Adele but would never happen to them. By saying that Adele did it wrong, and by not doing those “wrong” things, the singer can feel control. If they continue to do everything right, they won’t be injured like she was. They tell themselves that injury does not happen as a necessary byproduct of working a delicate instrument to an extreme. It’s a mistake. One they are not making. It is completely understandable but the damage it does to singers as an industry is profound. It means singers “push through” when they are sick, telling themselves they are “working around” an illness. It means they do not cancel a gig when it is recommended by a laryngologist. The reality is that injury happens in the most talented, skilled and proficient singers on the planet. It just did – to Adele. The sooner we stop blaming the victim and start allowing singers to cancel, to rest when they need it, and to have an injury that requires surgery, the safer the entire singing community will be. We will catch injury early, we will prevent injury, and we will advocate for a more merciful performance schedule. I cannot tell you how fervently I applaud Adele for speaking out. She could have decided to hide the truth. But rather than playing it safe, she admitted she is a human being engaged in an extreme sport and now she is hurt. Her confession is a balm to the singing community that they should welcome, rather than refute with claims of “better technique.” I ask singers I have operated on to talk about their injuries to each other. I am so proud of those who do because it releases other singers from the captivity of judgment. Each singer who is frank about their struggles helps the next to be open and allows the entire community to support them in their recovery, just like any athlete deserves. I hope that Adele has started a conversation that leads us to a place where we can protect singers, allowing them to continue to gift us with the music that we treasure.